Rising 113 feet above Graves Ledge at the mouth of Boston Harbor, Graves Light was once the most powerful lighthouse in New England. The US government built the tower between 1903 and 1905, with granite quarried from Cape Ann. The granite walls are 7 feet thick at the base, with the blocks bolted deep into the ledge and dovetailed together. About 90 feet to the south is a square oil house built to service the lighthouse. A house for the fog signal was demolished by the “Perfect Storm” of 1991. The first-order Fresnel lens measured 12 feet tall, at its peak casting a beam equivalent to 3.2 million candlepower. Graves Light has five levels of work and living space, including a former engine room, kitchen and library for the lighthouse keepers. The light was manned from 1905, when it first went into service, to 1976, when it was automated. The Fresnel lens is now the property of the Smithsonian Institution. The present solar powered beacon flashes twice every twelve seconds. 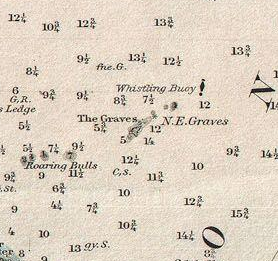 The Graves are marked by a whistling buoy in this 1877 navigation chart, 25 years before Congress authorized the lighthouse. Many maps erroneously state that The Graves, as the ledges are called, are located in the town of Hull, Massachusetts. Hull is a great town that we like very much, but the deed and title history show that The Graves are not a part of any town, but were directly owned by the Commonwealth of Massachusetts, whose governor ceded them to the federal government for construction of the lighthouse. Another common error about The Graves is the origin of the name. Stories that say The Graves got their name as the graveyard of many ships are very romantic and exotic, but they are false. So are the stories that they were named after a Revolutionary War figure or British admiral named Thomas Graves who lived in the 1700s or 1800s. Graves Ledge, or The Graves, is named after English Rear Admiral Thomas Graves (1605-1653), an early settler of Boston. 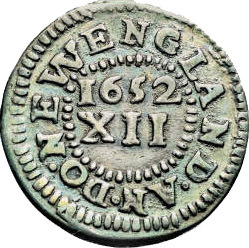 Born in Stepney, London, England, Graves served as vice admiral of the 11-vessel fleet of Governor John Winthrop in 1630. After capturing a Dutch privateer in 1652, Graves won recognition of Parliament, under Puritan leader Oliver Cromwell, and was appointed command of a warship, soon becoming a rear admiral. Graves was killed in 1653 during a naval battle against the Dutch. That year, Governor Winthrop named the hazardous stone ledges in Graves’ honor. 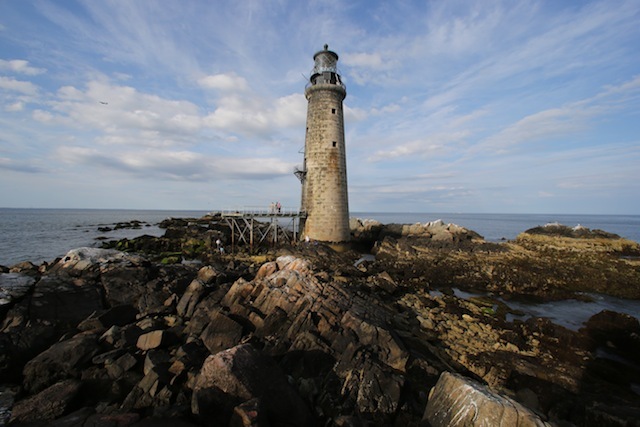 The Department of Homeland Security declared Graves Light to be surplus property, and the General Services Administration (GSA), which manages federal property, placed the lighthouse and Graves Ledge for sale in an online auction in June, 2013. 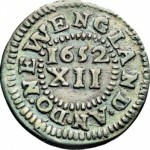 The auction ended in September, 2013, at which point the federal government conveyed the property to the new owner, businessman Dave Waller of Malden, Massachusetts. Ownership extended into a partnership with Boston businessman and philanthropist Bobby Sager in 2016. The Origins and History of the Flying Santa, 1929-2012, by Brian Tague, FlyingSanta.com. Admiral Samuel Graves (1713-1787) who was Governor of Boston and retired to Hembury Fort House in Devon and was related to Rear Admiral Sir Thomas Graves who was his nephew and also Admiral Lord Graves who was Governor of Newfoundland, may be the British Admiral of the Revolutionary Wars that the text refers to.